[Tony] built a high-efficiency power supply for Nixie tube projects. But that’s not what this post is about, really. As you read through [Tony]’s extremely detailed post on Hackaday.io, you’ll be reading through an object lesson in electronic design that covers the entire process, from the initial concept – a really nice, reliable 170 V power supply for Nixie tubes – right through to getting the board manufactured and setting up a Tindie store to sell them. [Tony] saw the need for a solid, well-made high-voltage supply, so it delved into data sheets and found a design that would work – as he points out, no need to reinvent the wheel. He built and tested a prototype, made a few tweaks, then took PCBWay up on their offer to stuff 10 boards for a mere $88. There were some gotchas to work around, but he got enough units to test before deciding to ramp up to production. Things got interesting there; ordering full reels of parts like flyback transformers turned out to be really important and not that easy, and the ongoing trade war between China and the US resulted in unexpected cost increases. But FedEx snafus notwithstanding, the process of getting a 200-unit production run built and shipped seemed remarkably easy. [Tony] even details his pricing and marketing strategy for the boards, which are available on Tindie and eBay. We learned a ton from this project, not least being how hard it is for the little guy to make a buck in this space. And still, [Tony]’s excellent documentation makes the process seem approachable enough to be attractive, if only we had a decent idea for a widget. One of the projects at the recent Hacker Hotel hacker camp in the Netherlands appeared to have achieved the impossible. A vertical PCB surface was holding pieces of paper as though they were pinned to it as on a notice board, yet there was no adhesive or fixings in sight. Was Harry Potter among the attendees, ready with a crafty bit of magic at a waggle of a wizard’s wand, or was a clever hack at work? Of course, it was the latter, as [Jan-Henrik Hemsing], had created an electrostatic adhesion plate because he was curious about the phenomenon. A PCB with extra insulation has an array of conductors on one side that carry a very high voltage. High enough for electrostatic attraction to secure a piece of paper to the PCB. The voltage is generated from an AC source by a Cockroft-Walton multiplier on the back of the PCB, and the front is coated with Plasti-Dip for insulation. It seems that soldermask is not a reliable insulator at such high voltages. Using the board, [Jan] was able to attach a piece of paper to it with a shearing force of 5mN at 3kV applied voltage, which may not sound like much but appeared to be just enough to carefully pick the contraption up by the piece of paper. The boards are designed for tessellation, so larger arrays could easily be assembled. We’ve never had a project quite like this one, but we have brought you an electrostatic ping-pong ball accelerator. There’s something oddly menacing about some vacuum tubes. The glass, the glowing filaments, the strange metal grids and wires suspended within – all those lead to a mysterious sci-fi look and the feeling that strange things are happening in there. Add in a little high voltage and a tube that makes its own hydrogen, and you’ve got something extra scary. This hydrogen thyratron ended up being just the thing for [Kerry Wong]’s high-voltage, high-current experiments. One would normally turn to the solid-state version of the thyratron, the silicon controlled rectifier (SCR), to switch such voltages. But the devices needed to handle the 30 amps [Kerry] had in mind were exorbitant, and when the IGBTs he used as a substitute proved a little too fragile he turned to the Russian surplus market for help. There he found a TGI1-50/5 hydrogen thyratron, a tube that has a small hydrogen gas generator inside – thyratrons are actually gas-filled rather than vacuum tubes and switch heavy currents through plasma conduction. [Kerry] set up a demo circuit with a small RC network to provide the fast switching pulse preferred by the thyratron, and proceeded to run 3500 volts through a couple of 1/4-W resistors with predictable results. The video below shows the fireworks. Can’t get enough of the thyratron’s lovely purple glow? We’ve seen it before on this beautiful old switch-mode power supply. The versatile tubes also helped rebuild the first vocal encryption system. The Jacob’s Ladder is an electrical device named after a biblical “ladder to Heaven”, consisting of a pair of vertically oriented conductors that spread apart vertically. These conductors are charged with high voltage, which creates the repeatedly climbing arc we’ve all come to know and love from science fiction movies of yesteryear. [LOOK MUM NO COMPUTER] was on a scavenger hunt for electronic junk, and came across a microwave in a skip that was begging to be hacked. After kicking around a few ideas, it was decided that the microwave would donate its high voltage transformer to create a Jacob’s ladder. The transformer is first bolted down to a piece of wood, and creates some sparks on the bench when shorted. The output is then wired to a pair of copper pipes to create the classic effect. Unfortunately, the device isn’t self starting, requiring the electrodes to be temporarily short circuited to generate the initial arc. We suspect that increasing the voltage may help things somewhat, either with another transformer in series or with a voltage multiplier. It goes without saying that high voltage projects do bring certain risks to life and limb that should not be overlooked. If you’ve still got a thirst for danger, check out this home built X-ray machine. Video after the break. In the end, we’ll leave judgment on the pros and cons of [Fran Piernas]’ creation to others. But let’s just say it’s probably a good thing that a detailed build log for this project was not provided. Still, the build video below gives us the gist of what must have taken an awfully long time and a fair amount of cash to pull off. The business end is a dental X-ray tube of the fixed anode variety. 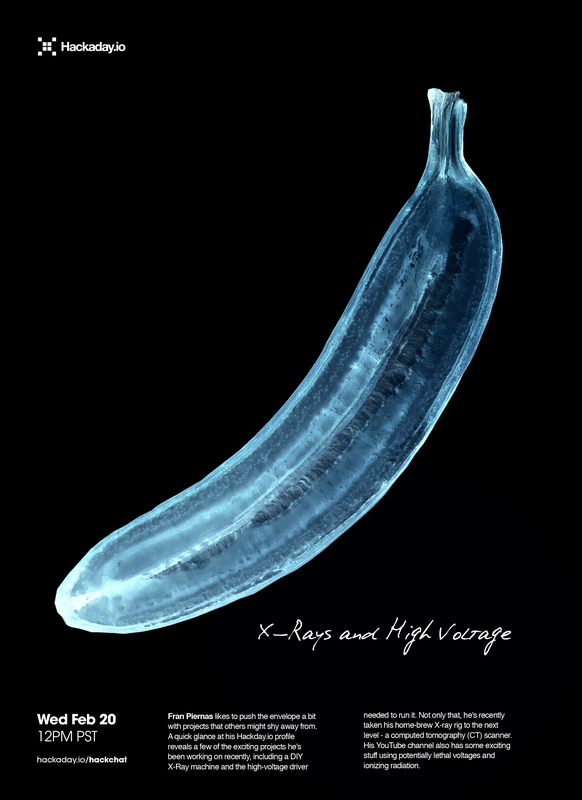 We’ve covered the anatomy and physiology of these tubes previously if you need a primer, but basically, they use a high voltage to accelerate electrons into a tungsten target to produce X-rays. The driver for the high voltage supply, which is the subject of another project, is connected to a custom-wound transformer to get up to 150V, and then to a voltage multiplier for the final boost to 65 kV. The tube and the voltage multiplier are sealed in a separate, oil-filled enclosure for cooling, wisely lined with lead. The entire machine is controlled over a USB port. An intensifying screen converts the X-rays to light, and the images of various objects are quite clear. We’re especially impressed by the fluoroscopic images of a laptop while its hard drive is seeking, but less so with the image of a hand, presumably [Fran]’s; similar images were something that [Wilhelm Röntgen] himself would come to regret. Safety considerations aside, this is an incredibly ambitious build that nobody else should try. Not that it hasn’t been done before, but it still requires a lot of care to do this safely. The Van De Graff generator is a device capable of generating potentially millions of volts of electricity which you can build in an afternoon, probably from parts you’ve got in the junk bin. This is not a fact that’s escaped the notice of hackers for decades, and accordingly we’ve seen several Van De Graaff builds over the years. So has high voltage hacker [Jay Bowles], but he still thought he could bring something new to the table. The focus of his latest build was to not only produce one of the most polished and professional versions of this venerable piece of high voltage equipment, but also make it accessible for others by keeping the design simple and affordable. The final result is a 40,000 volt Van De Graaff generator that’s powered by two AA batteries and can fit in the palm of your hand. Put simply, a Van De Graaff generator creates static electricity from the friction of two metal combs rubbing against a moving belt, which is known as the triboelectric effect. The belt is stretched between the two combs and passes through an insulated tube, which serves to “pump” electrons from one side to the other. The end result is that a massive charge builds up on the positive side of the Van De Graaff generator, which is all too willing to send a spark firing off towards whatever negatively charged object gets close enough. The video after the break guides viewers through the process of turning this principle into a practical device, illustrating how remarkably simple it really is. 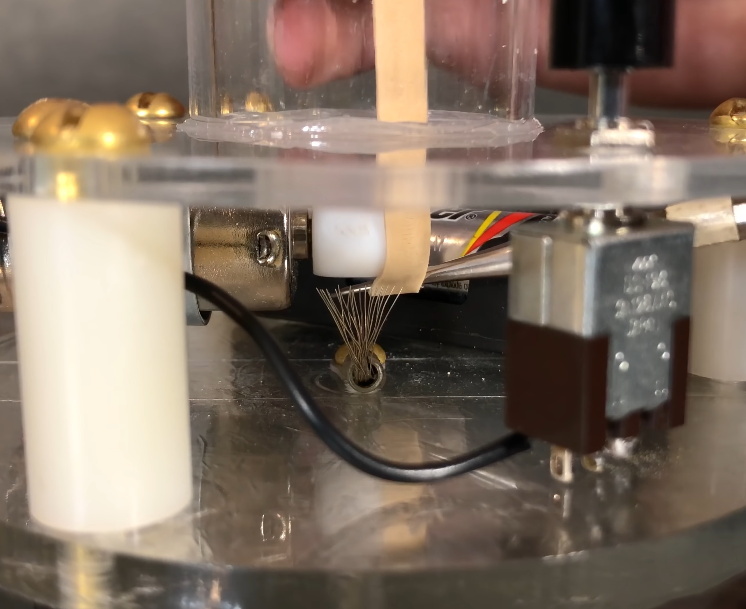 A common hobby motor is used to get the belt going, in this case just a wide rubber band, and the rest of the components are easily sourced or fabricated. Even for what’s arguably the most intricate element of the build, the combs themselves, [Jay] uses nothing more exotic than aluminum foil tape and a piece of stranded wire splayed out. Combined with the acrylic base and the purpose-made metal sphere (rather than using a soda can or other upcycled object), the final result not only generates healthy sparks but looks good doing it. Though if the final fit and finish isn’t important, you could always build one out of stuff you found in the trash.